Serving the Metro Atlanta North area since 1982, Universal Services LLC has proudly provided local residents and businesses with a variety of handyman services for over 37 years. Universal Services LLC handymen are great at performing various tasks to maintain or improve your Metro Atlanta North area home or office. From changing out of reach light bulbs, to installing or replacing your dishwasher, to repairing a broken floor board, our Norcross area handymen can quickly fix your problem. Universal Services LLC's friendly handymen provide maintenance and repair services year round in the Metro Atlanta North area. No matter what your needs, whether a single issue, such as fixing a broken switch, or a long list of chores, a handyman from Universal Services LLC is looking forward to doing the work for you. Why spend your nights or weekends doing chores? Hire a Universal Services LLC handyman to perform those chores and enjoy your free time! As a area handyman company, we often do jobs which people cannot or do not want to do, including ladder work, such as gutter cleaning, changing out of reach light bulbs, or even cleaning high, out of reach, areas. Universal Services LLC's Metro Atlanta North area handymen are also skilled at carpentry, plumbing, and electrical work. Why pay a premium for a master plumber or master electrician for simple repairs such as fixing a leaky pipe or changing a fuse, outlet, or switch? Quite often Metro Atlanta North area electricians and plumbers do not want small jobs. 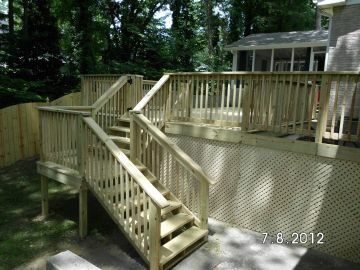 Likewise, Universal Services LLC can build you a shed, repair siding, fix a leaky roof, or remodel a room at significant savings over Metro Atlanta North area roofers and contractors. If you have work in the Metro Atlanta North area, that you can't or don't want to do, give Universal Services LLC a call at (770) 285-7017 and learn more about our handyman services. Call any time to discuss your Metro Atlanta North Handyman needs!